There was a time in Fort Collins when high-end, European lamps and lampshades were hard to come by. Internet shopping hadn’t yet presented desirable alternatives, leaving most customers to shop for home decor and interior design accessories either through catalogs or at a few large, “big box” department stores. That is, until 2001 when Vivian opened her doors to grateful shoppers. From the simple to the exotic, Vivian’s became the go-to, high-end, lamp, lampshade and home-decor alternative, located in downtown Fort Collins. Paxton Signs crafted Vivian’s hand-carved, gold-leafed sign to complement the store’s high-end appeal. 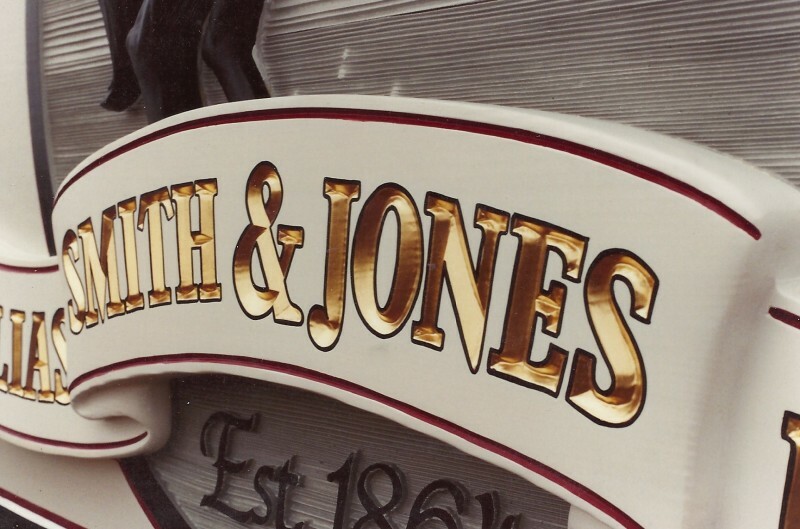 The letters and border were hand-carved in high-density urethane. The main panel was made from MDO plywood, then finished in a painted, purple faux texture. By combining gold leaf and the deep, purple texture, Paxton Signs produced a sign that reflected Vivian’s elegant cachet. Nearly ten years ago, DEEP BLUE Massage opened its doors in Fort Collins, offering beauty and innovative massages for everything from eyelashes to foot therapies. Their expertise soon made DEEP BLUE one of Northern Colorado’s preferred beauty and healing enterprises. 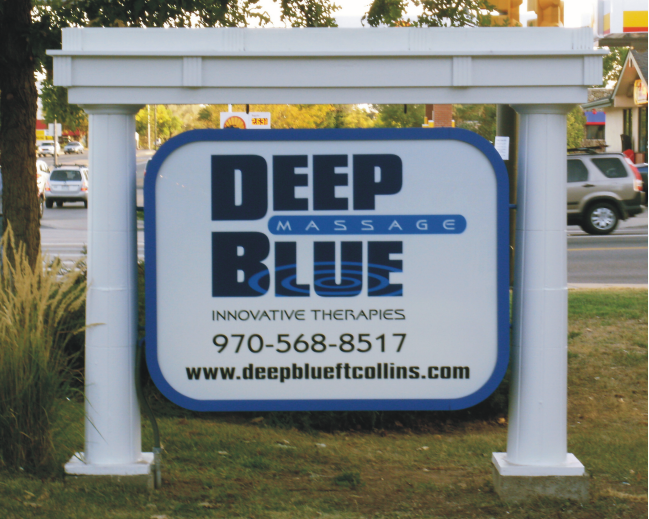 DEEP BLUE offered many services: Innovative massage that focused on individual needs; Specialized therapeutic and deep tissue treatments; Popular favorites, inclulding Couple’s massage, hot stone and pregnancy massage; Halotherapy (salt therapy), Deep tissue laser therapy and Ion cleanse (foot detox). Their mission was to provide therapies that allow the body to devote all of its energies to restoring itself. Paxton Signs designed the DEEP BLUE logo first, using the serene beauty of the center’s interiors, and their use of natural sounds, as inspirations for a calming visual identity. The 4′ x 5′, two-sided monument sign face was constructed of white acrylic Plexiglass with translucent vinyl used for letters and graphics. The surrounding blue border was created by using the sign cabinet’s existing 2″ retainer fascia. The existing pillars and pediment beam framed the sign, creating a unique, traditional composition. Over the years, Paxton Signs has worked with many faith-based organizations, helping them create and construct permanent signs for their local churches and gathering places, as well their attendant commercial enterprises. In 2005, Everyday Joe’s Coffee House contracted Paxton Signs to design and construct a storefront sign for their church-related business. The sign, shown below, is a single-faced sign designed by Paxton Signs, and measures 3 1/2′ x 10′. It is fabricated from 1/2” thick MDO plywood, cut to shape, and painted with a “faux” background to suggest texture. The logo and “COFFEE HOUSE” are cutouts of High Density Urethane. The Everyday Joe’s logo is rendered in two levels, with “COFFEE HOUSE” on one level. The letters, “COFFEE HOUSE,” are beveled around the entire perimeter of each letter. The remainder copy is rendered in premium quality, self-adhesive vinyl. All painted surfaces are finished with oil enamel or premium latex paints. As the community outreach of Timberline Old Town in Ft. Collins, CO, Everyday Joe’s Coffee House seeks to benefit and serve their neighborhood. They started by making the best cup of coffee they could for anyone who would come through their doors, and have continued to brew quality coffee everyday since. They proudly use beans roasted by Color Coffee Roasters and Oddly Correct Coffee. The coffee house hosts concerts, community events, and art installations because they “believe in good creativity, good causes, and good work”. Everyday Joe’s is powered by 30+ volunteers who practice what they preach: Love and acceptance. They are a “community space, gathering place, events venue, art gallery, and sanctuary with coffee in their blood and service in their hearts”. Heartwood Custom Woodworks, of Eagle, Colorado, was founded in 1992 by Carl Jordan, who literally grew up in his father’s cabinetmaking wood shop. Later, after completing a traditional apprenticeship with a German master cabinetmaker in 1983, Carl became that cabinetmaker’s partner for several years before he was inspired to open Heartwood Custom Woodworks. Today, Heartwood Custom Woodworks has an entire team of talented people who love what they do: Design engineers, highly skilled woodcraftsmen and finishers, installation specialists and office staff. Heartwood Custom Woodworks has produced fine custom woodwork for many stunning projects in Vail, Beaver Creek, Aspen, Steamboat Springs, and elsewhere in Colorado. Their work extends to other regions in the U.S. including, Florida, Texas, California, Utah, and Wyoming. 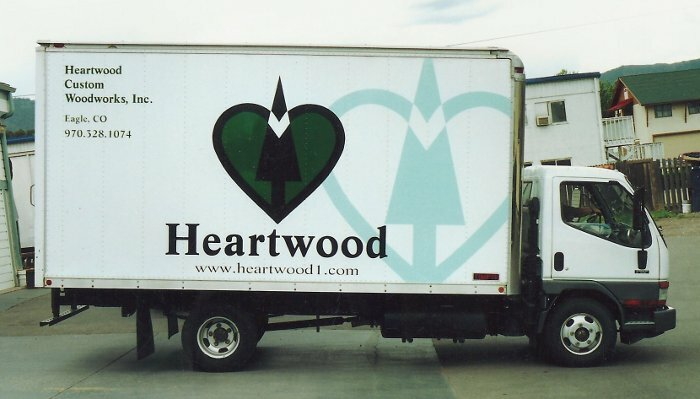 In 2004, Paxton Signs designed and produced the vehicle graphics for Heartwood’s delivery truck, (pictured below) an on-site production located in Eagle, Colorado on Colorado’s West Slope. The Bella Fiore storefront sign was one of Paxton Signs’ most memorable projects, dating back to the late 1990s. The sign’s high-profile border was hand-carved into High Density Urethane sections that were attached to a larger 5′ x 10′ HDU panel, using traditional tools, techniques and finishes to create the appearance of historic Italian exteriors. To replicate these authentic surfaces, the unfinished base and carved elements were “distressed” with cracks and blemishes prior to color-staining and applying faux finishes. The name, “Bella Fiore,” was hand-carved to imitate worn, aged lettering, then finished in the same fashion. The year was 2005 when Bryce Jewelers opened their store on East Hwy 34 in Loveland, Colorado. A subsidiary of Vintage Clock and Watch of Fort Collins, Bryce Jewelers provided high-end jewelry and clock and watch repair to the growing Loveland area. The store specialized in unusual timepieces, as well as unique, artistic, collectible jewelry. The building photo, below, is a representation of their storefront signage, including custom printed window awnings. Paxton Signs also designed the Bryce Jewelers logo for their fleet vehicles and other marketing uses. Today’s “THROWBACK THURSDAY” sign, Spring Creek Recumbent Bicycles, was designed and built by Paxton Signs in 2002. The sign was assembled using three layers of high-density urethane, shaped letters, art elements and logo, all applied to a black steel grid. Airbrushed color on the logotype added to its appeal. It was finished in oil enamel paint. Paxton Signs also designed the Spring Creek Recumbent logo, brochures and other print needs. We managed the bicycle shop’s advertising and marketing program, including its print advertising, POP advertising and Internet advertising. Spring Creek Recumbent Bicycles founding owner, Rob Walton, introduced recumbent cycling to northern Colorado. His positive, clever and enthusiastic business practices delighted his customers and local cycling enthusiasts. 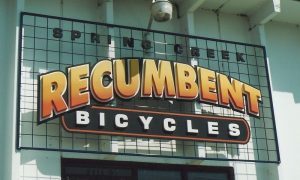 His legacy continues in the subsequent store that was renamed Rocky Mountain Recumbents. 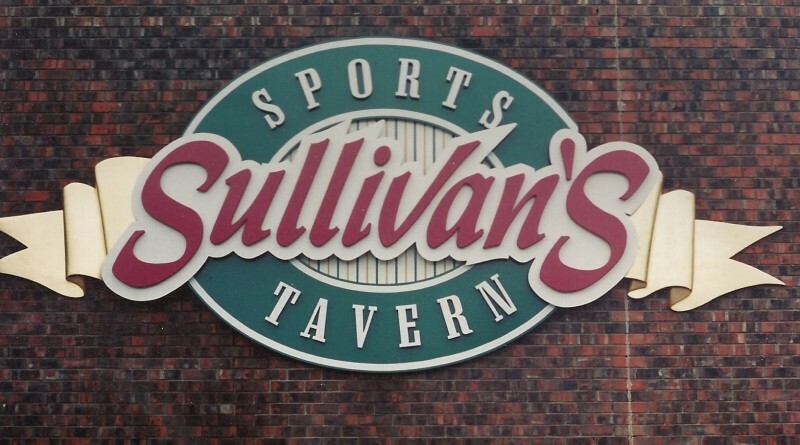 Today’s “Throwback Thursday” sign is Sullivan’s Sports Tavern, designed and built by Paxton Signs. Constructed in the mid-1990s, the complex dimensional sign combined hand-carved letters, and hand-carved, gold leaf banner elements. The sign was constructed of MDO sign board and high-density urethane, all sealed with an oil enamel paint finish. The sports tavern also used the sign design as their logo for all of their advertising and marketing purposes. 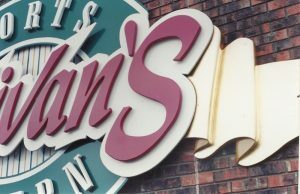 The Sullivan’s Sports Tavern was one of the first sports bars in Fort Collins, located in the adjacent Campus West area, near Colorado State University. 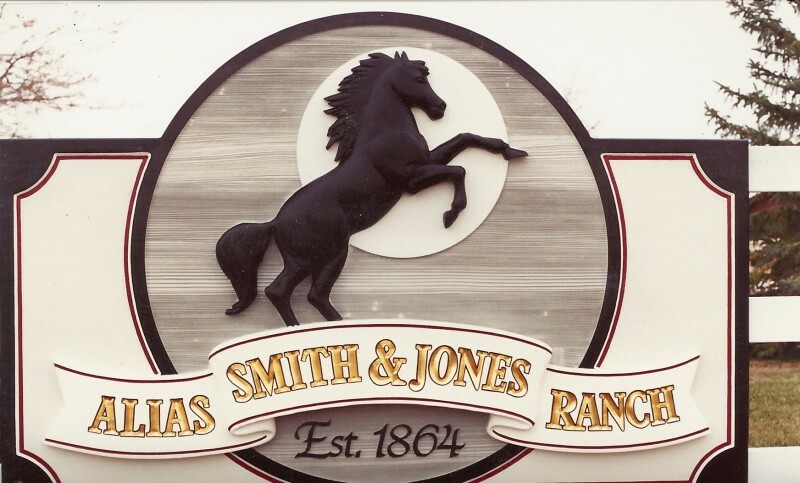 At Paxton Signs, we like to feature our valued customers, past and present, by sharing their stories and describing our sign projects with them. Many of our customers have interesting founding stories, others unusual histories or operational anecdotes. This week’s featured business is the Frontier Gallery, located at 208 S. Mason St. Fort Collins, CO. Phone: 970-484-4200. Frontier Gallery has been in business since 1991, specializing in old antique firearms. Their main focus is Old West and Frontier firearms up to, and including, WWII. It’s no secret: They LOVE what they do! Frontier Gallery believes that the history and development of guns is what makes old guns so much fun to own and shoot. It’s a memorable experience to shoot a firearm that was made in 1790, 1862 or 1943. It’s history in your hands. Besides handling and shooting the firearms, another interesting aspect in the industry is collecting guns that increase in value, guaranteed. Dave, the “chief cook and head bottle washer,” has been involved with old guns for over 30 years. He has had many rare firearms during that time, guns like the Colorado Territory Spencer, the factory Engraved Presentation Henry Rifles from 1862, and rifles presented to kings, among others. If you have old guns you want to sell, Frontier Gallery is the place to start. They’ll take a look and after a careful and thorough evaluation, they’ll present you with your options, either selling outright or consignment. Paxton Signs designed and created the Frontier Gallery storefront window sign using 23k gold leaf with matte centers, outlined with oil enamel lettering paint. The enamel lettering paint was also used for the window’s decorative elements and lower panel lettering. Details of the gold leaf lettering are shown, below. Contact the Frontier Gallery and explore the world of collectible guns at 208 S. Mason, Fort Collins, CO, on their website, http://frontiergalleryllc.com, or call them at, 970-484-4200. Visit Paxton Signs’ Galleries at, http://paxtonsigns.com, using the above menu bar, or call us at, 970-221-5519.